It's not that I haven't been cooking. I have but since our main meals are dinners and it's the season for afternoon thunderstorms, all my photos came out dark and grainy. I had a refreshing kedongdong juice three weeks ago in Kuching. This morning I found some kedongdong at the market. They were old with brown skin (age spots?) unlike young kedondong which have clear, clean green skin. My MIL likes to say "Everybody is beautiful at 18". That statement is true with all living things, isn't it? Only antiques get better looking with age. Anyway, the kedongdong. 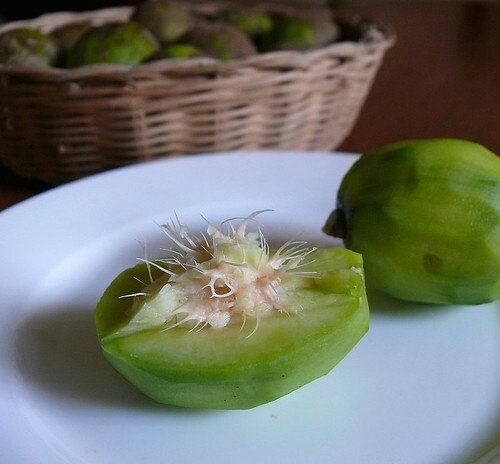 Kedongdong are back-yard fruits not grown commercially so they are not often available. The lady who sold me the kedongdong asked if I was going to "jarok" or pickle the fruits and was surprised that I was going to juice them. Back in the days when everyone was juicing their cucumbers, celery, carrots and even bittergourds, I resisted the craze. I managed a straight face and shut-mouth when juice-believers swore how juicing can clear the body of toxins and cure diabetes, hypertension and whatever the current disease. My kids never grew up having the luxury of mommy juicing their fruits once a month, let alone daily as expounded by my juicing friends. I also avoid food supplements because I think that's a lazy way to get your nutrients. I have a friend who eats supplements instead of real food and her biceps are flabbier than my 80+ year-old mom's. Anyway, I never believed in juicing because all that fibre is removed and I couldn't resist stirring some back into the juices and of course that didn't make them taste as good and so the kids never craved for juices. Now of course we know that the biggest problem with juices, fruit juices especially, is that you can get too many calories. One orange is about 60 calories so five oranges in one glass is 300 calories. That is a sure way to get fat and diabetic, especially since Asians are predisposed to diabetes. However, once in a while I do love some juice and this glass of icy sweet-tartish kedongdong juice was enough to get me chilled through the hot day. 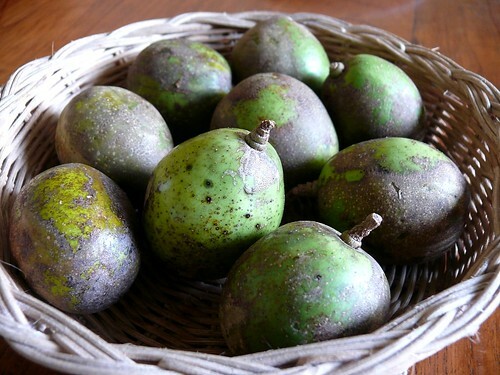 Mature kedongdong have a brown-green skin and are about the size of a small chicken egg. 1. Peel the kedongdong. The fruits are so sour that by the time I peeled 12 of them, my fingers were all puckered. Mature kedongdong have a spiky fibrous seed while young kedongdong have no seeds but are more sour. 2. Top the juice with lots of ice and a bit of cold water. Add about 1/4 teaspoon of salted plum powder for the ultimate drink. You can substitute the salted plum powder with a small pinch salt and sugar but it won't be as good. have never seen this before. it looks like hardworking one and tries to reach everyone. does it taste like a premature mango ? i would like to try to make salad with it. sweet and sour maybe. Wouldn't the drink be sour and slightly salty? I always order this when I am home. Love it and can't find it elsewhere. 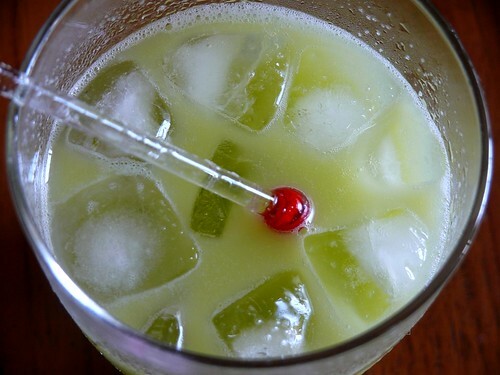 In Kuching, they usually put sour plum or tangerine skin in the drink. 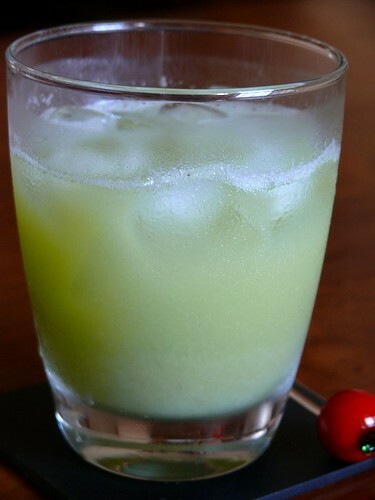 It kind of neutralizes the sourness of the drink and makes it sweet. It is a very good thirst quencher in tropical weather. I have not try this before. And it sure sounds refreshing, especially in this hot weather. jim:yes, it's kinda like a raw mango. we eat it just like tt smtimes, with a salt dip! We have this in Kuala Lumpur too! At a corner coffee shop at Queen's Avenue in Jalan Peel. This place has great chay kuay tiew! I tasted it for the first time last weekend in KL. I liked it so much, I had 2 glasses in one sitting.